Jimmy Jacobs and Cameron Cage have been tearing up the tag team division in Revolution Championship Wrestling in Illinois. They've fueded with teams of Tweek & Jason Allen, Machine & Willie Richardson, and most recently squared off against the Legion of Doom. Jimmy Jacobs and Gutter have been seen teaming together on multiple occations in Michigan. The duo has fueded with Foreign Exchange Policy, a large clique consisting of Thurston Skowl III, C4, Jimmy 2 Sweet, and whomever else they bring along. Their fued has traveled from PWF to MMWA, most recently. The Blitzkrieg Kid and Jumpin Jimmy Jacobs have only teamed once back in June 5 in New Option Wrestling when the Kid needed a partener to take on his arch rivals, the Cocky Little Brats. 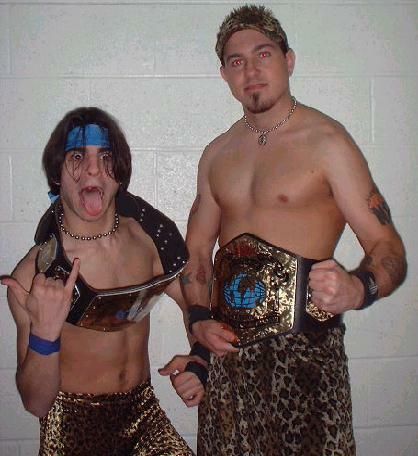 On April 9, 2000, Blitzkriegkid and Jumpin Jimmy Jacobs took out the team of Michael Stryker and Colt Cabana then later on took out the Playboys of Wrestling to become the Pro Wrestling Federation tag team champions! In New Option Wrestling these days, the BIG Bully NEVER walks alone. He is always accompanied by his 320 pound monster, Osyris or the Big O as he is called. As The Bully's enforcer, Osyris has helped Jimmy in a battle yet again with the Cocky Little Brats. On one occation, Jimmy teamed with Slayer in a match with Knighthawk for the NOW World title. Collectively known as Great Human Beings, or GHB, they are the Gorgeous Gavin Starr, the HYPE Jimmy Shalwin, and the BIG Bully Jimmy Jacobs but more importantly, they are the Lakeshore Wrestling Organization tag team champions. They defeated Frankie the Face and Special J in a sham victory for the titles. The 3 of them defend the titles one match and alternate back and forth. The GHB are a force in the LsWO.